On Nov. 28, Atlanta finally received rainfall for the first time in more than a month. The heavy rain caused flooding and standing water on local interstates, resulting in many accidents, according to the Atlanta Journal-Constitution. This incident shines a light on what drivers should do when they encounter a flooded road. The heavy rain caused dozens of crashes across metro Atlanta, which led to long delays for drivers, especially on I-85 in Gwinnett County, according to the AJC. The Marietta Police Department was concerned about the rain’s impact on traffic and issued a text and online alert urging drivers to use caution as they make their daily commute. “Nearly a month of no rain has left the roadways with a large buildup of oil that becomes slippery when wet. Leave yourself more time than usual for your drive and watch for large puddles in the roadway,” the department said in the alert. Floods or standing water may present a challenge to drivers as they may be unsure of how to proceed through the area. Here are a few safety tips to keep in mind when driving through a flooded area. 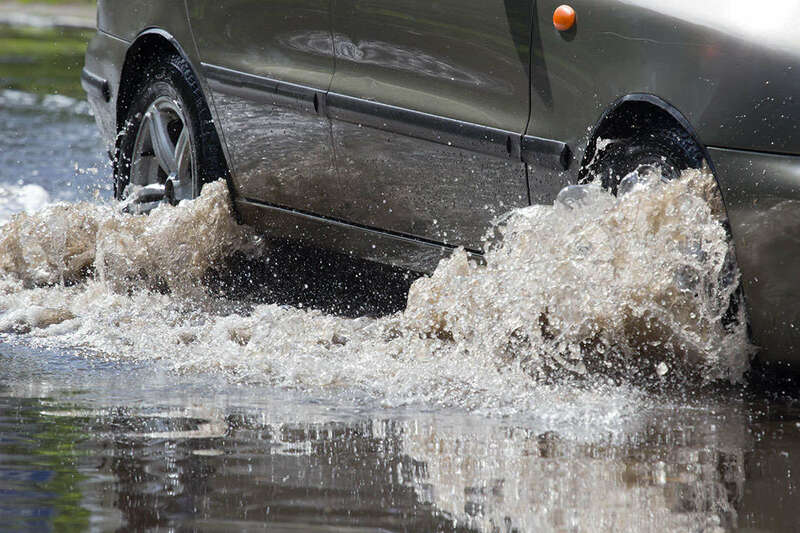 Drivers may underestimate how deep standing water is when navigating through flooded roads, believing the water is a lot shallower than it actually is. A motorist can lose control of their vehicle in just six inches of water, which can lead to stalling or submersion, according to the Weather Channel. Once taken by the flood waters, your car can be swept away, tipped on its side or flipped over by the current. When you are in a flooded zone, be sure to turn your vehicle around and find an alternate path, according to the National Weather Service’s “Turn Around Don’t Drown” campaign. During heavy rainfall, some drivers may still attempt to drive at high speeds, which could lead to an accident. Wet pavement contributes to nearly 1.2 million traffic crashes each year, according to the American Automobile Association. Slowing down on flooded roadways can help to keep your vehicle from hydroplaning, which causes your tires to rise up on a film of water, according to AAA. As little as half an inch of water on the road can cause tires to skid, which could lead to you losing control of your car. To prevent hydroplaning from occurring, you should slow down and avoid hard braking or sharp turns. It also helps to drive in the tracks of the vehicle ahead of you, according to AAA. An emergency kit could prove to be a lifesaver when you are caught in a flood. Your kit should have basic essentials such as first aid supplies, non-perishable foods, and water, according to the AAA. In addition, your kit should have tools that you may need if you are trapped in your car because of floodwater, including an emergency hammer for breaking vehicle windows when they can’t be rolled down, according to AAA. The rear window may be the best way to escape when your vehicle is submerged in water. A flashlight is also a useful tool, especially when if it is dark and the area lacks streetlights. Flashlights can also be used to illuminate the inside of a submerged car so that you can escape. If your car becomes submerged by floodwaters, do not panic. Unbuckle your seat belt and roll down your window, but do not attempt to open your door, because it allows more water to come into the car, according to Popular Mechanics. As mentioned above, if your window does not roll down, break the window with a hammer. If there are children in the vehicle, they should exit first. After they have escaped, swim through the window to safety as quickly as possible, advises Popular Mechanics. Driving a car, bus, or motorcycle through a flooded area is just one of the many dangers that heavy rain can pose to motorists in Atlanta. Drivers who do not reduce their speed during inclement weather also present a hazard to other motorists. If you’ve been hurt in a car accident due to a driver’s negligence, we can help. Read more to learn what our car accident attorneys can do for you. If you are ready to pursue a claim, fill out our free, no-risk case evaluation form today.